Beryl’s is a unique natural microbiota for chickens. It is composed of the normal gut bacteria from healthy adult, specific pathogen-free (SPF) chickens. The competitive exclusion mode of action is the natural phenomenon where normal healthy intestinal bacteria colonize the intestine and out-competes potential disease causing bacteria. To do this, the healthy microflora colonize the gut and produce a low oxygen, low pH environment, which is unfavorable for enteropathogens. As the gut is colonized by the complete microflora, there is competition for essential amino acids and sugars between anaerobes present in the normal gut microflora and enteropathogens. 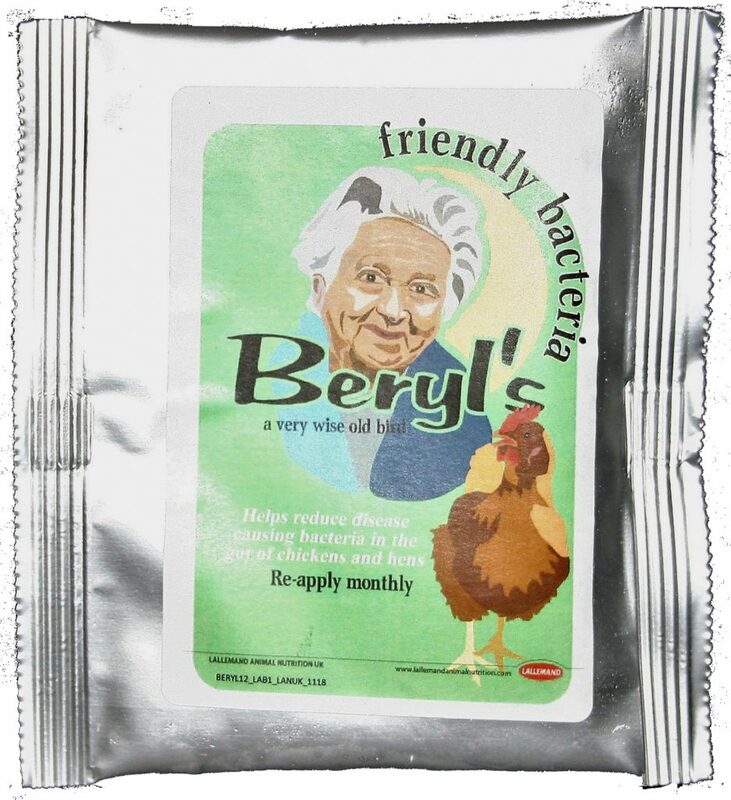 Beryl’s Friendly Bacteria is a soluble powder containing over 200 different friendly bacteria which help to exclude disease causing bacteria, including Salmonella, E-coli, and Clostridium Perfringens, in the gut of chicks and all adult poultry. This helps to produce and maintain stronger, healthier birds in a natural way. As with humans, poultry require a complete balance of ‘friendly’ bacteria in the gut to help maintain good gut function and health. Without this protection they are susceptible to all kinds of disease causing bacteria. Is Beryl’s Friendly Bacteria necessary? Disease causing bacteria, such as certain strains of salmonella and Clostridium perfringens, can cause illness, giving the birds diarrhoea and leading to dehydration. E. Coli commonly causes respiratory problems in hens. Beryl’s Friendly Bacteria becomes established in the gut and excludes the bad bacteria, reducing the likelihood of infection. There are many reasons why the balance of gut bacteria gets disturbed. This happens if birds are stressed, change diet, or if they are treated with antibiotics. Giving Beryl’s as early in life as possible, and thereafter every 4 weeks, ensures , that the perfect balance is maintained throughout the stresses and strains of everyday life. Salmonella Enteritidis and Salmonella Typhimurium are just two of the strains of salmonella which are commonly associated with human food poisoning. By protecting the hen from these bacteria, we also help protect ourselves. Beryl’s Friendly Bacteria helps to protect the eggs and it reduces the chances of cross infection to humans. Nevertheless, correct cooking of eggs is also important. All ‘Legbars of Broadway’ chickens are treated with Aviguard (the commercial version of Beryl’s), from week one , then monthly until the birds are transferred to a new home. This treatment has been followed for the past fifteen years, producing stronger chicks, and allowing better development and weight gain in the growers. The result is a strong, and vigorous young adult chicken which is more likely to go on to enjoy a naturally healthy life, with good management, and given the correct free-range conditions. Beryl’s Friendly Bacteria colonise the chicken’s gut and prevent establishment by disease causing bacteria. When chicks are hatched and reared by the mother, they naturally pick up their mother’s friendly bacteria from her faeces, but most domestic chickens are hatched in incubators and so are separated from their mothers. They are therefore susceptible to whatever unhealthy bacteria are in their surroundings. Beryl lived in a cottage in the Malvern Hills, where she kept a back-yard flock of chickens. Some scientists in Malvern wanted to develop a natural product to protect hens from salmonella, based the competitive exclusion concept, so they searched for some local donor hens to help develop the product. Beryl donated the friendly bacteria from her flock, and after rigorous testing by the Veterinary Laboratories Agency, the samples were certified safe and free of all known avian pathogens. From this culture a master seed was developed, and each batch is produced from this, by fermentation. Is Beryl’s the same as a probiotic? No – probiotics are made from a single or small number of strains of bacteria and must be fed daily. Beryl’s Friendly Bacteria contains over 200 different friendly bacteria. Only complex cultures have been proved effective in their protective effect against harmful bacteria. Is Beryl’s compatible with other products e.g. garlic-based products, water sanitisers/ disinfectants & antibiotics? No – any product which has an antibacterial effect will harm Beryl’s Friendly Bacteria. Why does Beryl’s have a distinctive odour? Beryl’s has a distinctive odour, so it is advisable to mix it in a well-ventilated room, or outside. The friendly bacteria are anaerobic and are smelly by nature. When should Beryl’s be used? For day-old chicks to get them off to a good start and provide early protection against bacterial infection. On transfer to the new home, as the stress of transportation, and moving to a new environment can disturb the gut flora. This often shows as diarrhoea or wet droppings. 48 hours after the end of antibiotic treatment. Monthly, thereafter, to maintain a normal balance and healthy gut flora. Yes. Aviguard is the brand name for commercial packs and comes in pack sizes, sufficient to treat 2000, 5000, and 10,000 birds. All ‘Legbars of Broadway’ chickens are treated with Aviguard from day-old onwards. Prevent contamination of food, food utensils, drinking water, grazing, etc. IN LIQUID FORM: Ingestion of liquid should be avoided. A suitable (aerosol) mask and impermeable gloves should be worn.